The remains to two late Iron Age brochs. Although only a portion of each exist, the remains give a ‘cutaway’ view of the configuration of the fortifications. Brochs are owned by Historic Scotland. 1. Aside from Dun Telve and Dun Troddan, the best preserved brochs can be found at Mousa, Shetland and Dun Carloway, Lewis. 2. Stone from the Glenelg Brochs was removed and reused when building the nearby Bernera Barracks. 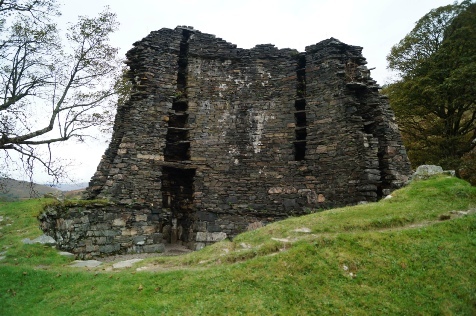 Notes: Both brochs are popular tourist attractions and are sign-posted from Glenelg. They are both found on the same unnamed road with lay-bys for parking at each. 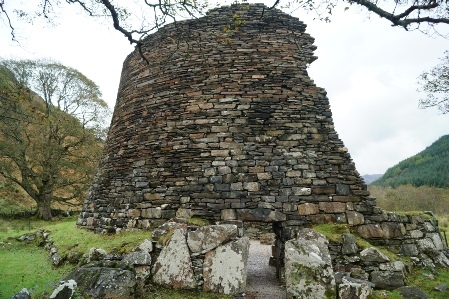 Close to the small village of Glenelg are two late-Iron Age brochs known as Dun Telve and Dun Troddan. Located less than half a kilometre apart, the two structures give an excellent insight into this type of fortified homestead that is unique to Scotland. 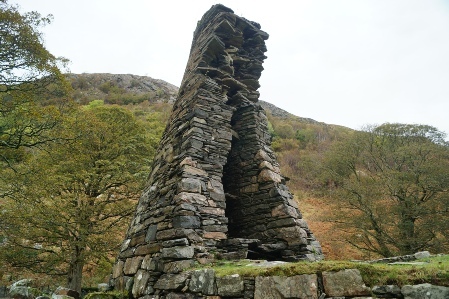 Both Dun Telve and Dun Troddan are drystone constructions that originally stood over 10 metres tall. They were built to a concentric design with an outer and inner circular wall set around one metre apart effectively creating a hollow wall. Large horizontally placed slabs created floors within the hollowed section and also housed a winding staircase to access the upper levels of the broch. The two walls enclosed an area around 20 metres in diameter and it is likely there were two or three floors within each broch; it is possible the ground level was used for livestock with the main residential chamber on the floor above. A single small entrance led to an extended passage that was sealed by a wooden door that could be barred from the inside and was further protected with a small chamber along its length perhaps for a watch-dog. Historians continued to debate the role of brochs within the community. Some suggest it was simply a fortified homestead for a family group but Dun Telve and Dun Troddan are unusual for their proximity to each other as most stand alone. This has prompted some historians to moot that the broch may have had a similar relationship with their communities as later Tower Houses; namely the fortification would have been the centrepiece of a wider settlement whilst acting as the local ruler's house and a refuge for all in time of attack. The brochs each had a single entrance. The twin concentric walls created a hollow passageway around the broch.